He’s Biblical, quirky and offers up a great nickname. Thanks to Paul for suggesting Zebulon as Name of the Day. Zebulon made Nameberry’s Ten Great Names You’re Not Using list a few months ago. And if you think about his logical nickname – Zeb – it’s true. Playgrounds are packed with boys called Zach and Seb. 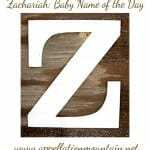 (Since 2000, nearly 125,000 boys have been named Zachary. Over 47,000 have been called Sebastian.) And as parents dust off Biblical names faster than you can say “Puritan,” I’m even hearing Jebediah – Jeb – and Jedidiah – Jed. Lastly there’s dwelling or house, listed in a few others. My best guess? Zebulon has something in common with Katherine. While we like to give her meaning as pure, research suggests that she’s actually derived from the goddess Hecate. Reference that first possible meaning for our friend Zeb. One of Baal’s titles was “rider of the clouds” – a fitting image for any god, and one that incorporates the meaning elevated, too. So yes, he’s a Biblical babe – but with a pagan past. He also sounds Colonial cool, thanks to some early American Zebulons. Zebulon Heston came to the US in 1684 along with his fellow Quaker settlers. Zebulon Butler and Zebulon Pike were both soldiers during the Revolutionary War. Zebulon Pike’s boy – also named Zebulon Pike – is well remembered for the mountain he didn’t quite scale. Pike the Younger became a solider and an explorer, mapping the head of the Arkansas River and much of the Louisiana Purchase. In 1806, he attempt to climb the mountain that we now call Pike’s Peak, in the Colorado Rockies. Deep snow and inadequate supplies kept him from making it to the top. Pike continued his military career through the War of 1812, eventually dying in service. Journals of his treks through the American southwest were published in 1810, and widely read. 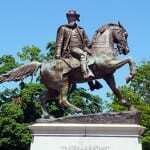 You’ll find a place named in his honor in at least a dozen states; in Georgia, the county seat of Pike County is Zebulon. The name faded in the nineteenth century, though there’s Zebulon Vance, a former Confederate Civil War officer and influential North Carolina politician post-war. He’s made only five appearances in the US Top 1000 – in 1891, 1978-1980 and 1984. And yet Zebulon might be just on the right side of quirky, thanks to that zippy nickname. If you like obscure Biblical picks – and aren’t fussed about his non-Christian roots – he’s one to consider. Named my baby one of those “out there” names 5 months ago. He is Ephraim. He absolutely does not stand out in his daycare room. All the children have different names. Love Ephraim. Looks beautiful. Sounds old-fashioned. Love it. Zebulon I’m not sure about but I like Zebediah! Congrats on your new little guy, Abbie! And I think you’re right. Clio sounds absolutely normal in her little school – the names range from Jayden and Cayden to Ida and Mabel and everything in between. I like Zebulon. I definitely think it could work today — the fact that it ends in N like so many English boys’ names makes it seem a little less over-the-top than a choice like Jedidiah, I think. I do think Zebulon would work better than Zebedee. Although Zebedee is fun to say, it sounds a bit silly to me, kind of like a buzzy bee noise. It always interests me to consider which biblical names have become acceptable in our culture (like Benjamin, Elijah, Asher, Noah, and Ezekiel) and which ones are still seen as too “out there” by many (like Zebulon, Boaz, Hiram, or Ephraim). Some of the “out there” names strike me as just as attractive and usable. I think Zebulon is really cool. Zeb makes it very usable but is too cowboy for it. I like it for others and would be impressed. Incidentally, I think the word “Ba’al” simply means Lord and was used as a general appellation for numerous gods in the Ancient Near East. Thanks, Charlotte – you’re right about Ba’al. Still, I think parents turning to the Bible for a religiously-inspired name might be disappointed to find that their name has any connection to any kind of pre-Christian worship, especially one linked to Beelzebub. I do like ‘Zeb’ though and I like that it sounds like something out of Star Trek too. My first thought was that it sounds like a video game. I also like Zebedee, which is also in the Bible – but it totally says ‘Magic Roundabout’ to me too. Not my style, but I do have a friend who recently dreamt that she and her husband had three kids and named one of them Zebulon! Yes, they just had a daughter in August. They named her Tamar Sophia. If she’d been a boy, they would have called him Asher. Also one of the twelve sons of Israel, but a slightly less obscure one. No. Not for me. But heavily Biblical verging on Star Trek -esque names are not my scene. Great link, Bewildertrix – thanks! I like Zebulon because of Zeb – and I’m not usually a nickname person! Back in the day when I was a teacher, I had a Zeb and a Jed in the same class. I would say they were probably born around 1979, coinciding with its appearance in the Top 1000. I’m just a hop, skip, and jump away from a small town called Zebulon. It is more colonial than Biblical to me (largely because I’m a dunce when it comes to the Bible). I love Zeb (yep, Zebedee was on the longer list, but it’s too ‘out there’ for the OH and, honestly, for me too – but you get Zeb, Zed, and Zee from that, so it is a name I still love). Zebulon, (which looks slightly like it could be from a freaky sci-fi/robot movie: zeb-you-LON, when mispronounced and said in a robo-monotone), is a little too much for me…. even when pronounced correctly. I think it’s partly how it looks that makes me feel like it’s too much. As for meaning, I can see how gift, sacrifice, honor, and exaltation are all related ideas, so perhaps the meaning of the z-b-l or z-b root could incorporate all of those concepts… just a thought. Stick it in the no pile with Ezra and the other way too biblical names! this was a name a friend and I used to joke we’d bestow on a cat. Not for me! I really like Zebulon. Its cool, hip and zingy. I like the possible nickname option of Zeb. I wish it was more common, like the other similar Biblical names that seem to have skyrocketed. DH was supposed to be Zebulon Zachariah when he was born in 1975. Instead he is Jason Robert! But still we have considered using it as a nod to him. Or at least Zeb which I find a bit more user-friendly. Of course, I’m a fan of short boy names to begin with so take it for what its worth. […] Zebulon – Not quite as rare as Zebedee, and just as valid a way to get to Zeb, Zebulon Pike lends this name some mountain-climbing cool.